Love it or hate it (or do both -- I understand), when it comes to Indian cooking this fluorescent yellow spice is here to stay. I have a love-hate relationship with turmeric. It's one of the core spices in Indian food, has compelling medicinal benefits, and plays a role in Hindu religious rituals. But it also stains like crazy, tastes bitter if you overdo it, and can make all Indian food look uniform. Seriously, have you ever seen a plateful of Indian food where all of the different dishes look straight up YELLOW? That's when I turn my back on turmeric and grab an In-N-Out cheeseburger instead. Actually, make that a hamburger. After a meal of overused turmeric, the yellow coloring of the cheese could push me over the edge. Seriously, turmeric has been around for a long time -- likely at least 2,500 years. India is the largest producer. The plant's (part of the ginger family) rhizomes are baked, then ground to make the fluorescent yellow spice. It's employed in Ayurvedic medicine, used as a home remedy for various stomach ailments, and perhaps most compellingly, has been shown in studies to potentially increase brain function (maybe even warding of Alzheimer's disease), decrease the risk of certain cancers, and act as an anti-inflammatory (providing relief for arthritis sufferers). One of my cousin's regularly sprinkles small amounts of turmeric into all kinds of random non-Indian dishes (even her morning oatmeal) in hopes of taking advantages of its health benefits. It's also available as a supplement in pill form. One of the traditional Hindu wedding rituals is to rub turmeric all over the bride's and groom's skin the evening before the wedding -- it's thought to impart a glow and perhaps to ward off bacteria. However, I'm most likely taking a pass on this. Somehow the night before Nick's and my wedding does not seem like a good time to be trying out new skincare products. I'm terrified that I'll wake up the next day with a full-on acne break-out. Taste-wise, I find that it doesn't have a strong taste and is used more for color. But in excess amounts, it tastes bitter. Some people detect a ginger-like flavor. How to Prepare: Buy the already ground powder from either the regular grocery store or from an Indian store (where it will likely be less expensive per ounce, but is sometimes in too large a quantity for the home cook), then sprinkle generously into any savory Indian dish. 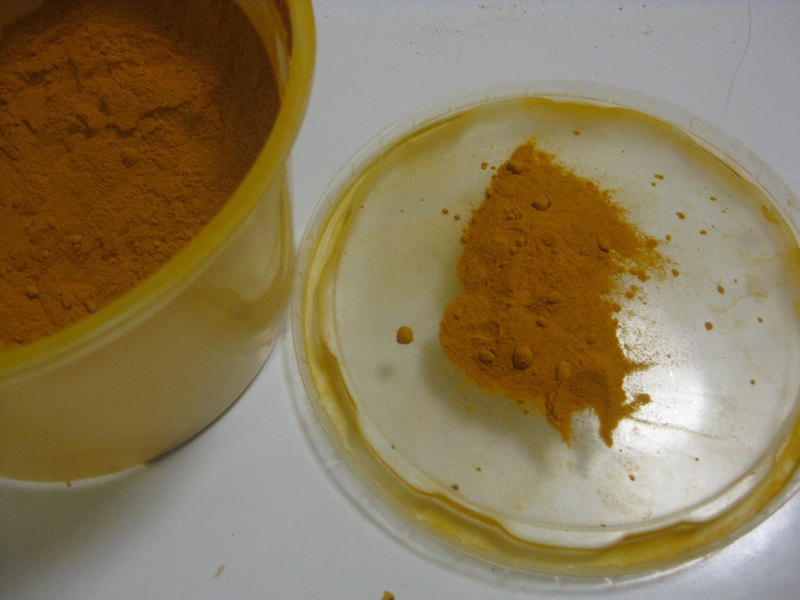 In countries where fresh turmeric is ready available (like in India), sometimes the leaves are used for cooking -- but I've never seen that in the U.S., where the powder reigns. What is your favorite dish to put turmeric into? Do you have any tricks for stain clean-up? This is my first time i visit here. I found so many entertaining stuff in your blog, especially its discussion. From the tons of comments on your articles, I guess I am not the only one having all the leisure here! Keep up the good work. I have been meaning to write something like this on my website and you have given me an idea. I really admire the important ideas that you offer in the content. I am looking forward for more important thoughts and more blogs. I am truly inspired by this online journal! Extremely clear clarification of issues is given and it is open to every living soul. I have perused your post, truly you have given this extraordinary informative data about it. Oh my goodness! an amazing motox3m interesting article dude. Thank you However I am experiencing issue with ur rss Papa Louie awesome article . Don’t know why Unable biggest collection to subscribe to it. Is there anyone getting identical rss problem? Anyone who knows kindly Snail Bob 10 respond. Thanks! Kabar gembira buat para pecinta judi kartu dan poker. dewajudiqq sebuah situs judi online terbaik dan terpercaya SE-INDONESIA yang khusus di persembahkan buat anda semua. DEWAJUDIQQ merupakan situs judi kartu online terbaik dan terpercaya di INDONESIA, Disini dipastikan tidak ada campur tangan BOT dalam permainan. DIJAMIN 200% play FAIR (player vs player). DEWAJUDIQQ mempunyai banyak bonus promo yang menarik dari pada situs JUDI lainnya. = Bonus Cashback/Turnover yang besar. = Bonus Referral/Refrensi yang sangat menguntungkan para member setia yang telah mengajak temannya bermain di DEWAJUDIQQ. DEWAJUDIQQ juga menyediakan banyak jenis permainan yakni. Minimal Deposit dan WD yang sangat murah yakni Rp.15.000,- anda sudah dapat bermain 7jenis permainan di sini. SUPPORT BANK NASIONAL yang disediakan oleh DEWAJUDIQQ, memastikan segala proses transaksi para member akan dilakukan secara CEPAT, AMAN dan NYAMAN. Dengan support SISTEM TERBARU membuat anda para member DEWAJUDIQQ , dapat mengakses segala jenis permainan dari smartphone anda.DEWAJUDIQQ sudah menggunakan sistem terkini yakni mensupport anda bermain di IOS dan ANDROID. Maka itu kami hadir dengan meluncurkan sebuah website poker yang dapat di mainkan dengan menggunakan uang asli. Dengan minimal deposit hanya Rp 15.000, Anda sudah dapat bermain, Dan menangkan JACKPOT hingga RATUSAN JUTA RUPIAH. - Permainan yang Anda mainkan di MetroQQ adalah Poker Fair Play. - Poker tanpa menggunakan sistem bot, Murni Player vs Player. - Transaksi Deposit dan Withdraw cepat. - Kami juga menyediakan 5 bank local seperti BCA, MANDIRI, BNI, BRI, dan DANAMON agar para member mudah untuk bertransaksi. - Dilayani CS yang Ramah dan Profesional, Siap melayani para member setia MetroQQ selama 24jam full. - Bonus Rollingan sebesar 0,3% - 0,5% di bagikan setiap hari Senin untuk member-member setia MetroQQ. - Minimal berusia 18 tahun ke atas. - Memiliki no. rekening sendiri atau rekening yang valid. - Nama pengguna/user dibuat oleh pemain itu sendiri. When it comes to being a foodie, the only two things I can really claim expertise in are Indian food and red velvet cake. Figuring I'd best leave the red velvet cake blog to someone in the South, here's my take on Indian food in southern California. Logo design, header, and pepper by MKGrafix. Simple theme. Powered by Blogger.